In racing, the goal is obviously to win. 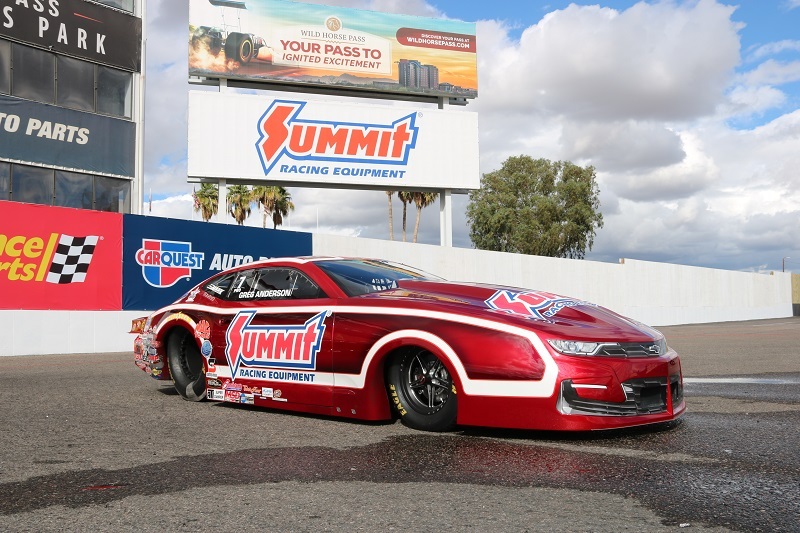 For Greg Anderson and Jason Line, drivers of the Summit Racing Chevrolet Camaro Pro Stockers out of the Ken Black racing stable, winning is more than a goal—it’s an expectation. In 2018, the team that has accumulated eight NHRA Mello Yello Drag Racing Series championships scored a collective six victories, 12 low-qualifier awards, and had four KB Racing-powered entries in the top 10. They were, nevertheless, deflated to have fallen short of their own expectations. The team was quiet in the off-season, but one would be mistaken to view this lack of noise as an indicator of sullen defeat. 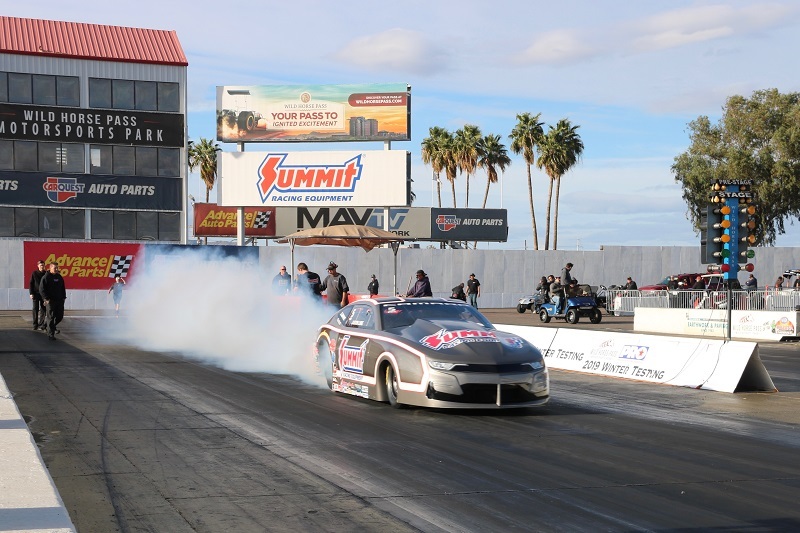 Now entering their 17th season as Black’s powerhouse factory hot rod team, the group spent the time between the 2018 NHRA Finals and the 2019 Winternationals with their heads down. They weren’t licking their wounds, they were putting together a plan. OnAllCylinders spoke with Anderson and Line during the pre-season test session at Wild Horse Pass Motorsports Park in Phoenix, AZ. You had such a great run at certain points in the 2018 season, but the year didn’t conclude how you would have hoped. In hindsight, can you narrow down the root cause? Greg Anderson: It was a combination of things. The drivers didn’t do a good enough job, we didn’t do a good enough job with the racecars, and we didn’t have a power advantage. It was a weird season for us. In previous years, we’ve been proud that we could execute well and stand out, but we just couldn’t say that last year. It happens to the best of us, and this year we are working very hard to have everything in place and be sharper—especially come playoff time—so we can be back on top with our Summit Racing Chevys. How did you approach the time away from the racetrack these last few months in order to set up for a season that surpasses last year? Greg Anderson: It’s been a busy winter. We’ve worked on a lot of things and have a lot of projects in the works that will come to fulfillment throughout the season. But over the winter, we did a lot of development work and put in a lot of effort. It’s hard to say how everything is going to shake out, though. You really don’t know until you roll into Pomona. Even pre-season testing doesn’t seem to answer these things; you have to get to that first race to know who did the best job. Were there any big changes made over the off-season? Greg Anderson: We made a few changes. One is the new car, the Jerry Haas Chevrolet Camaro that Jason will be driving. This is kind of a new development for us, because we haven’t had a new car in several years. The old horses seem to be getting a little tired, so we’re starting with one new one, and we’ll see what the season brings. If it shows promise, we’ll get another one. We’ve also added Dave Connolly to the mix to work alongside Rob Downing on the decisions for the KB Racing cars, and that was a deal we were working on for a few months. We were very happy that it all came together and we were able to bring him with us to the test session in Phoenix. It was a great trial run, and we’re certainly looking forward to working with Dave this year. He’s a great addition to the team. How about mindset, is it different for you coming into 2019, and if so, how and why? Greg Anderson: It definitely is. I had a subpar year last year, and you take that personally. I’m not ready to fold up my tent. I can still win races and championships, I know I can, I just have to find the right formula and get back to driving the racecar the way I used to. Age is not my problem. I have to stop worrying about the little things and go have fun. It’s a different year with only 12 races in the regular season before the Countdown to the Championship, so you don’t have a cushion like you’ve had in years past. You can’t really use any race as a test session to prepare for the Countdown; there are too may quality cars, so you’re going to have to race every race, or you’ll find yourself on the outside. If you have two or three bad races, you won’t even make the Countdown. I think everybody is going to be on top of their game every race we go to. What does KB Racing look like in 2019, how many cars, who will be driving? Greg Anderson: It will look very similar to last year. 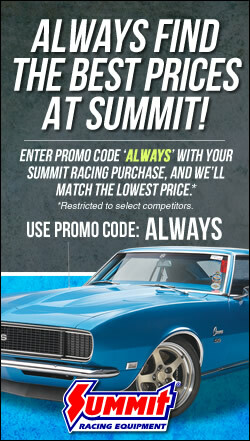 Of course, Jason and I will each be in a Summit Racing Chevrolet Camaro. Bo Butner is coming back full-time thanks to the shorter schedule. Deric Kramer will run all of them, and so will Fernando Cuadra. His son, Fernando Cuadra Jr., will also be at about half the races this year, but that won’t be a KB Racing car or engine. They have their own car and engines, and they’ll be running Fernando Jr.’s car out of their own trailer completely on their own. They’re looking at it as an educational year, and we’re glad to see another Pro Stock car in the field. 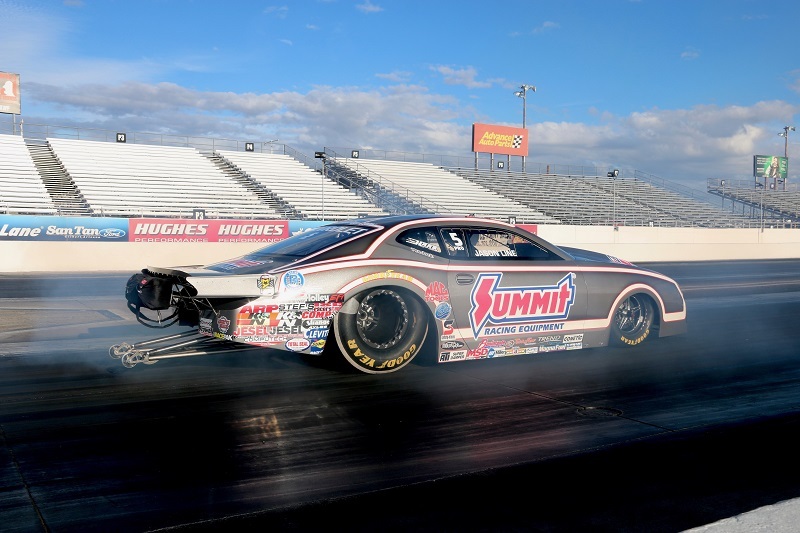 We ask you this every year, but with a fresh perspective as you approach your 22nd season as a Pro Stock driver, how much importance do you place upon starting the season on a positive note? Greg Anderson: I think it’s more important than ever. There isn’t a lot of room for a bad race or a mistake, and you can’t start off in the hole. You can’t win the championship in the first race, but if you get off to a bad start it can have a pretty big impact on you later. Greg Anderson: It’s going to be a different deal this year. I’ve always said that I love to race as much as possible, but I also love my time at the shop, and Ken Black has provided us with a beautiful facility to work in. We’ll have more time to work on things there in the raceshop this year, and I’m looking forward to that. Generally during the regular season, you don’t have much time to do research and development. You’re really just maintaining. But this year, we’re hoping to have more time for that. If we do, this could be a set-up year for the future. Looking back at last season, was there anything you would have done differently either in terms of processes or mindset, and if so—what? Jason Line: For sure, but I think you’d say that every year. If you went through a whole year and didn’t learn anything, it would be wasteful. You have to continue to learn, especially in your tough seasons. We definitely learned a lot last year and know what we need to fix going forward. We’re in a very positive mindset right now, and that’s a good way to start a new season. Talk about the changes made within the team over the off-season. Jason Line: We did some restructuring in regard to who does what, redistributing some responsibilities, and I think that will make things a little bit easier. We’ll be doing things in a way we haven’t done before. We also have some unique opportunities that have opened to us. We’re going to take advantage of those opportunities, and although we don’t expect that we’ll see the results fully show up today, they definitely will in the future. Will you be doing any Sportsman racing this year with the shortened Pro Stock schedule? Jason Line: You could have a Buick sighting every now and again. You never know. The main factor is time, and our Summit Racing Chevy Camaros—as well as all of the cars in the KB Racing stable—are going to have most of our time. But if time should allow, sure. Sportsman racing is where I came from, and it’s always going to be something I enjoy. Obviously, you want to start the season on a positive note. Are you feeling that pressure heading into this first race of the 2019 Mello Yello Drag Racing Series? Jason Line: No pressure, but if you want to win them all, you have to win the first one. Every race is important, and you’d like to start off well, so it matters for sure. I’m looking forward to being better. We see the opportunities to do things differently in the shop as a positive for us. We’re going to get better as the year goes, for sure. The Countdown format changes things a little, but this first race still matters. We still want to go win every race for Summit. What do you see as your biggest challenge this year? Who cares? NHRA has been nothing but snooze fest for years. I’m sick to death of seeing Pro Stock fields full of nothing but Camaros. None of the other pro ranks have had any creativity or individuality since Garlits retired. Nothing any more but mega teams racing their bank accounts and sponsorship money. Camero vs camero vs camero, where is the channel changer? I am sick of Cameros. When Harleys dominated motorcycles they changed the rules for more parity. Now any brand can win. Back in my day when Glidden dominated they made him run more weight than the Chevys to make it competitive.